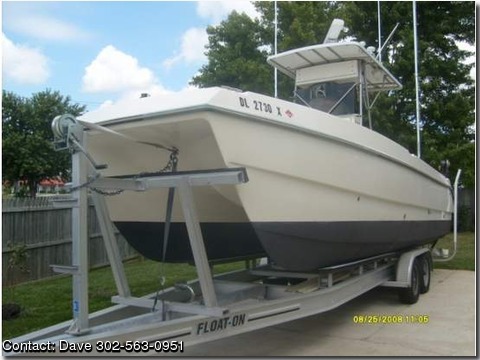 1996 SEA CAT 25FT Blue Water Pro CC (New Four Strokes in 2002), ***CONTACT THE OWNER OF THIS BOAT: DAVE 302 563 0951 OR 302 323 9635 OR djb66@verizon.net *** 1996 25 FT Sea Cat Blue Water Pro Center Console powered by Twin 2002, 115 HP Four stroke Yamaha outboards with 550 hrs on them and well maintained. It is on a 2006 aluminum Float On trailer and comes with 15ft Rupp out and 15ft center riggers. Boat has had Gas tanks and lines, T Top, hydraulic helm and pumps, through halls with hoses, and all wiring replaced. The electronics are as follows: Furuno 582 L color sounder, Garmin GPS, Furuno GPS, JRC 2344 6KW Open Array Radar, FM stereo with Sirius satellite radio hook up, ACR 406 Cat II EPIRB, 2 VHF marine radios, Azimuth 1000 Flux Gate Compass, Major Power 12-24 Dc Converter. I AM SELLING THIS RIG AS A COMPLETE FISHING PACKAGE WITH THE PURCHASE OF THIS BOAT YOU WILL ALSO GET ALL RODS, TACKLE AND EQUIPMENT THAT YOU WILL NEED TO GO AFTER TUNA AND MARLIN. Included in the sale is Shimano Tiagra 80 W, 50 W, 3- TLD 25s, Penn International 50TW, and 2- 30 TWs all on Outer Banks Rods, Penn 835 Fathom Master Electric down rigger, 2 Aftco gaffs, Huge Canyon Products Fish Bag, Canyon stand up harness, Play Action belt harness, 125 Qt Icey Tek cooler, trophy strip teaser dredge, Tournament Cable St.
Thomas bowling pin teaser chain. Bags of lures including seven strand, Iland, Mold craft, Braid, Yo Zuri, spreader bars and daisy chains with birds and many other brands. Also includes leader, hooks, weights, box of fish traps and all terminal tackle needed to troll or chunk. Boat comes with all safety equipment including 6 Sterns Offshore life vest and all flares are up to date. BOAT IS LOCATED IN: Bear, DE.